Lou Reed first rose to prominence as a songwriter and front man out of the 1964 New York Art Scene when Andy Warhol championed The Velvet Underground. The band created a fusion of the avant-garde sensibilities of the art world with rock and roll that was dissonant, transgressive, and poetic. Their subject matter included topics taboo in rock at the time such as gender dysphoria, sado-masochism, and drug addiction. Reed led the band with a vulnerable cynicism and a potent use of language that combined with the musical innovations of the band with a signature quality that has made them one of the most influential bands in music history. Reed went on to embark on a solo career that would span fifty years, beginning with his legendary 1972 album Transformer co-produced by David Bowie featuring “Walk on the Wild Side,” “Satellite of Love” and “Vicious,” catchy and powerful anthems that earned the record significant commercial success. Its release was followed by the somber concept album Berlin, a narrative of a tragic New York love affair between two city misfits inhabiting the forbidding landscape once wrought by The Velvet Underground in an emotional interplay of operatic proportion. Daunted by the mediocre response to the album Lou Reed seldom revisited its material when playing live, even after experiencing his greatest solo successes with the two successive albums Rock n Roll Animal and Sally Can’t Dance. In 2003 Rolling Stone Magazine who had originally panned the record upon its release, dubbed it one of the greatest albums in rock history. Several prominent musicians had voiced their devotion to Berlin and Reed was compelled to revisit the work he had all but abandoned with a live concert at Brooklyn’s St. Anne’s Warehouse. New York artist and filmmaker (Basquiat, The Diving Bell and the Butterfly) conceived a film around the concert, complete with super-8 visuals furnished by his daughter Lola to accent the narrative progression of the tracks. 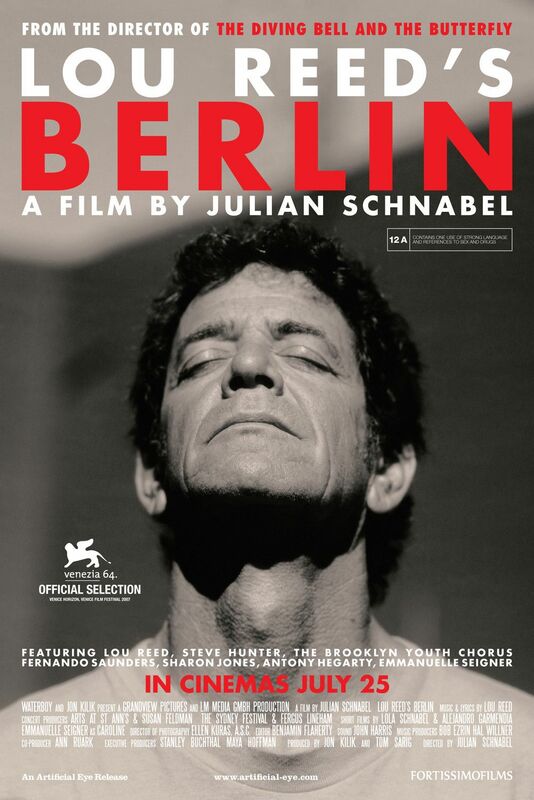 Lou Reed’s Berlin is a nostalgic experience of New York’s artistic and musical landscape, both through the identity and integrity of Reed and his ensemble and the beauty of the original album it restores to glory, that ends on a note of triumphant evocation and a standing ovation from the house.